Another wake-up in the dark and cold requiring many layers of clothing. 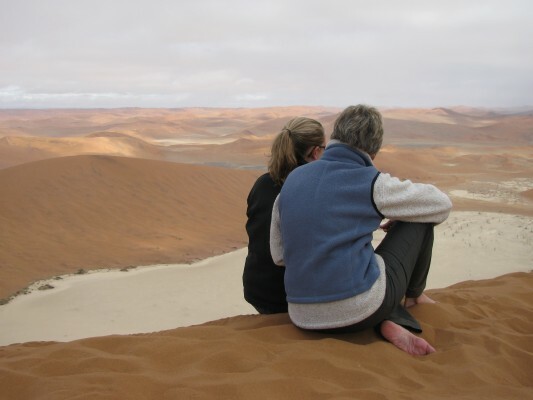 A quick breakfast and then off to Sossusvlei before 6:00 am. A lot of fog, just like home, only unexpected. 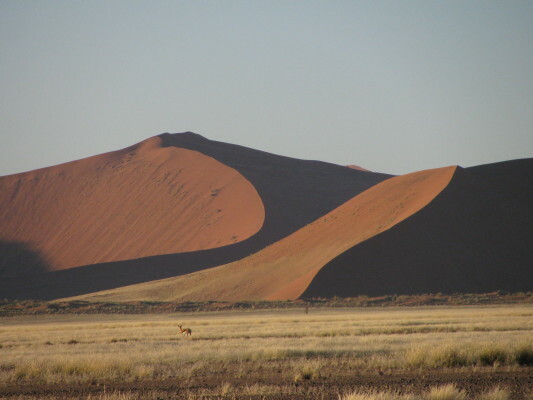 The sun comes up making the dunes–many of them 1000 feet tall–appear blood red, creating graceful shadows on the curvaceous mounds of sand. One after another, different shapes and sizes, all huge. Regan, our guide, parks the Land Rover. 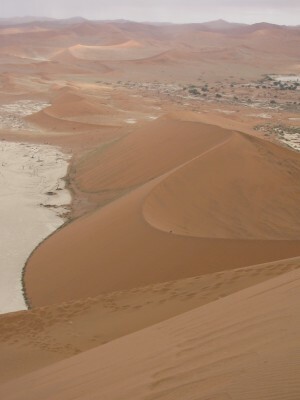 The trek up Big Daddy, one of the largest of the dunes, begins. 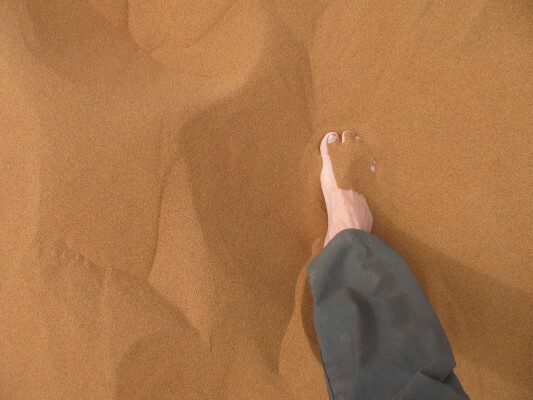 The climb is strenuous but lovely, barefoot in the silky sand. 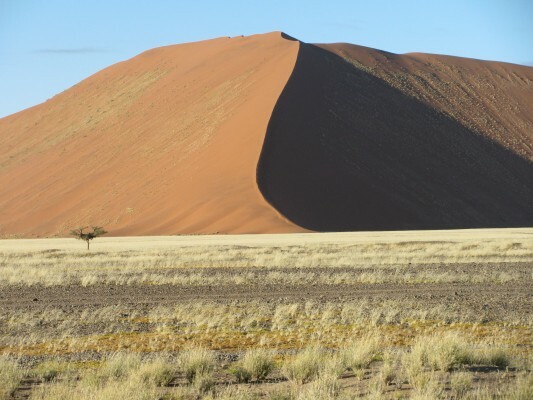 Up and up we go, walking along the knife-edge where the sides of the dune meet, feeling that familiar fear of falling, concentrating on each footstep, just what is immediately ahead. Stopping to take in the gorgeous views all around, the multitude of colors. Arriving at the top and the stunning panorama, one of the most beautiful sights ever. Staying a long while, drinking it all in, not wanting to leave, not wanting to break the spell. Unaware of time, being entirely present in the moment, wanting to be nowhere else in the world. 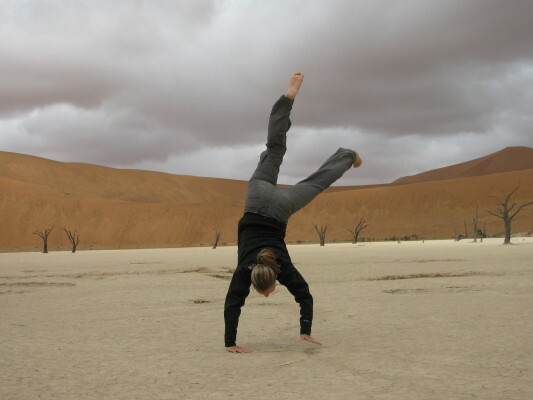 Still cold and cloudy, unusual for Namibia even in winter. Storms in Cape Town ride the cold Benguela Current affecting the climate here. 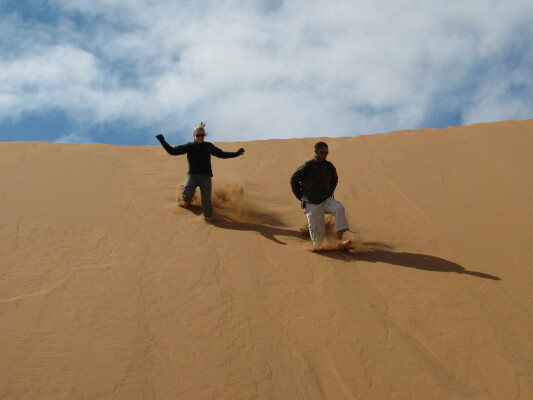 The trip down is totally different, delightfully fun, running down the steep face of the dune, laughing all the way, giggling like a kid. 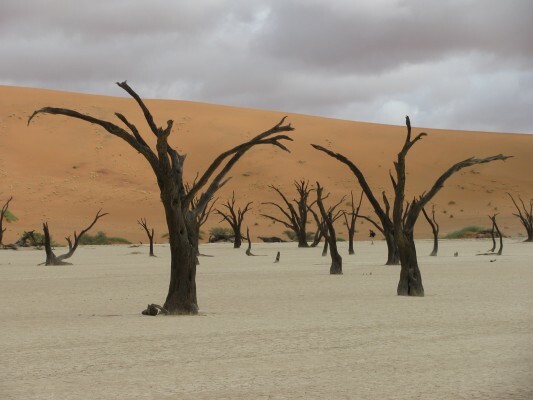 The huge pan of the Dead Vlei is below, dotted with dead acacia trees said to be five hundred years old. Wonderfully picturesque. Six hours later, back at the beginning. Words cannot express what I have seen, what I have experienced. Simply put, this has been one of the finest mornings of my life.